Do you want to show your Canadian pride? We are not talking about waiting for 2016 for the Summer Olympics in Rio. We are talking about how YOU can represent your country on the poker felts, and reward yourself handsomely by grabbing a share of a jaw-dropping $800,000 in the Battle of Nations at 888poker! Representing our country in the Battle of Nations at 888poker couldn't be any easier or more fun. The Battle of Nations begins with you competing against fellow Canadians in the daily Battle For Glory Free Tournament where you can try to prove you are among this country's best while winning a share of $1,000. This tournament takes place at 18:08 GMT, and in addition to the cash you can win, those finishing in the top five percent of the field will receive a ticket to the weekly $20,000 Battle of Nations Free Tournament on Sunday at 20:20 GMT where you can play for even bigger rewards! As we already mentioned, if you make it past the first round, you will earn the right compete for even bigger money and bigger pride in the Battle of Nations Free Tournament. This awesome and free tournament will award $15,000 to the winning players. Additionally, 888poker wants everyone for the winning team to celebrate in style, and is giving away another $5,000 to be shared between each player that was on the winning team! If you are wondering how to get a ticket or two for this amazing poker competition, rest assured it really isn't that difficult. If you do not already have an account, just download 888poker through our links, and you will not only receive two free tickets to a Battle For Glory freeroll, but can also enjoy many of the amazing games on 888poker for free with a $88 no-deposit bonus! If you already have an account at 888poker, you should have already received your two free tickets to a Battle of Glory freeroll, and can hop right in and show your Canadian pride while attempting to pad your wallet at the same time. Once you use these tickets, you can earn more tickets by either completing daily missions or win more tickets and other great prizes by playing the free Globe of Fortune game every day. 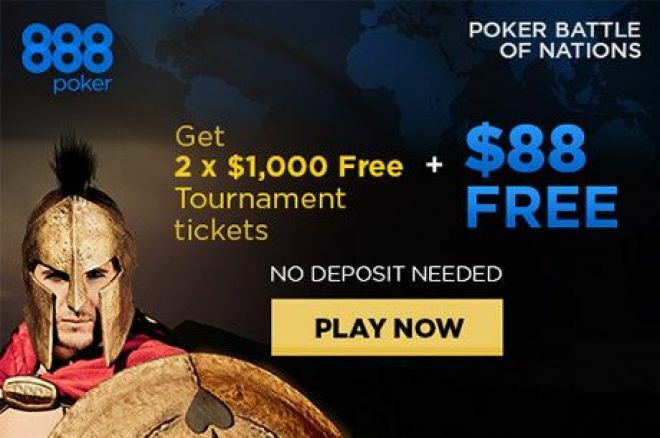 As if these weren't enough, 888poker will also award any player on the winning team a free ticket provided they are playing online at 888poker on Sunday, giving you even more incentive to root for your team to win the Battle of Nations! The Battle of Nations promotion is only around until May 3, so don't wait for next year's Olympics to show your Canadian pride and do your best to win some of the $800,000 of free money being giving away! Download 888poker through PokerNews Canada today to get started! Head to our Battle of Nations promo page to learn more information about this amazing promotion. Don't Miss the "$5,000 Live the Dream" Freerolls on 888poker! 888Poker Gift Showers: Don’t Miss the New All-In Tournaments!